Most of the buildings I've featured on tourATLANTA have been office buildings, entertainment venues, churches, or mixed-use buildings. I'm breaking that trend and featuring a residential building. Even though a residential building is not likely to be on any city tour, as a tourist I personally like to know what certain buildings are, especially if they're architecturally interesting. The Buckhead Grand (a five star condominium) falls into the "architecturally interesting" category, as well as the luxury living category...for the views alone it would belong to that category. 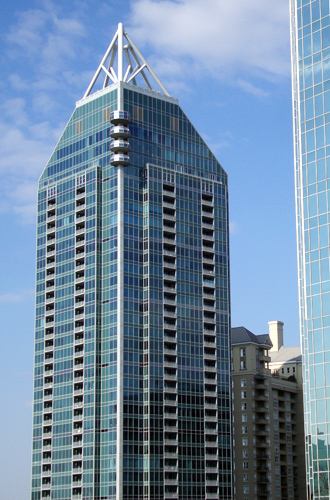 As disclosed by its name, the Buckhead Grand is in the heart of Buckhead, Atlanta's financial district. The condos, soaring 36 stories, are the epitome of luxury...floor to ceiling, lobby to penthouse, inside and out. If you want an idea of just how luxurious these condos are, stop by the Museum of Design Atlanta to see their current exhibition, Water Dream. Several of the bathroom design displays exude luxury...the sort you'll find at Buckhead Grand. The "flying saucer" discs jutting out from the corner on the upper floors are very unique...balconies! Does it get any more grand than that?